A versatile lighting option, pendant lights come in many shapes, sizes and materials. Whether clustered in twos or threes over an island bench or as a single statement piece, these decorative lights easily become the focal point to a kitchen. When you decide on using pendant lights, you need to ask what main lighting function will it serve in the kitchen? Is the lighting to create ambience? Does it act as all-purpose illumination or will the pendants lights highlight specific areas? The type of illumination you need from your pendant will depend largely on what types of lighting are already available in your kitchen and if you use your island for more mingling and snacking or for preparing meals. If you have other sources of lighting (which is usually the case) then it is best to choose accent lighting that has a dimmer switch to your lights, that way the light output can be controlled and complement other planned light sources. Finally be careful of heights! There should be at least 72 to 82 centimetres of space between a kitchen island and the lowest hanging point - something that many people don’t consider….right up until they smack their heads on a low hanging pendant! For most households, the primary activity undertaken in the kitchen is the preparation of food. Task lighting directs light to a specific work area to provide illumination for a specific task such as cooking, food preparation, washing and food storage. 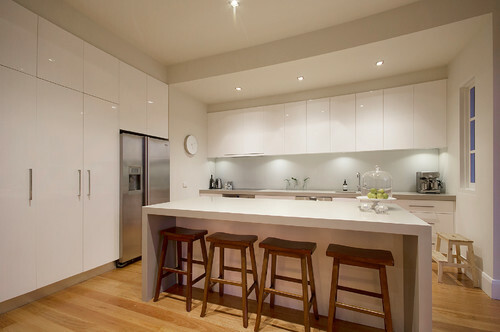 Task lighting should be considered for cookers, worktop surfaces, sinks and fridges. 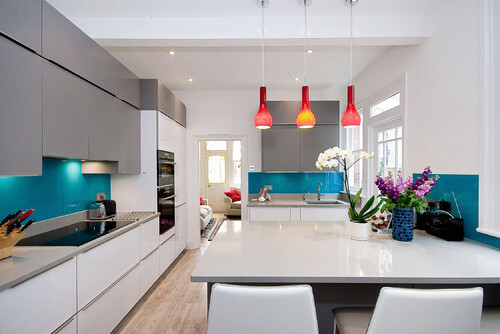 There are times when general lighting and task lighting may not be sufficient, especially in a large kitchen. Spotlights can be added to increase illumination and be directed over task areas. Consider using dimmer switches to regulate the lights to just the right level needed as well as saving on energy costs. 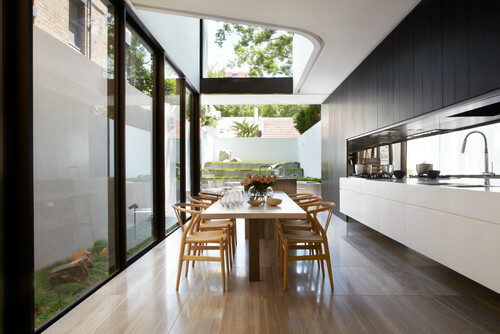 Sunlight in a kitchen should be a primary design consideration. Consider adding a window backsplash below the cabinets to allow more natural light in or add a skylight to make a dramatic change to the light and ambience of your kitchen. Another way to add more natural light into your kitchen is to add floor-to-ceiling glass stacking doors that overlook your garden. Corner windows also extend the breadth of the kitchen and are absolutely stunning for extending the vista to the garden and beyond. If you are looking for a discreet way to add brightness in your kitchen and hide the light source, then lighting inside cupboards or under cabinets will do the trick. Linear and puck lights are the two main under-cabinet lighting options. Running the entire length of cabinets, linear LED lights can be customised to the length of your cabinetry and provide a uniform source of light that’s not too “in your face”. Puck lights on the other hand are individual fixtures that result in more concentrated beams of light. 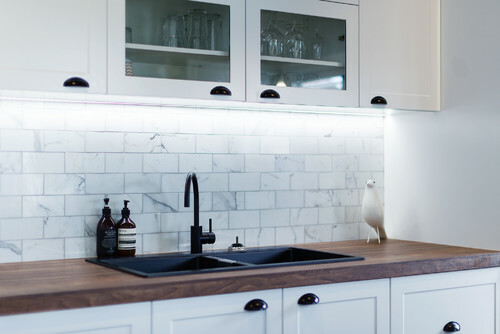 Ideally used to highlight architectural features of your kitchen, such as a marble splashback, puck lights are best placed 50 centimetres apart, creating scallops of light. If you have a kitchen with a low ceiling, recessed lights may be your safest bet. Layering your lighting is critical to good kitchen design. Combining with your other choice of illumination, recessed lights can help make your kitchen feel balanced and create an inviting space. Aesthetics are in the details, where recessed lights come with a variety of trim options and apertures that can add a distinctive style. If you have a wood ceiling, high-end fixtures are offered in a metal finish which can add a modern touch. On a practical note, you will need a ceiling with good insulation since humidity can build up inside of the light fixture. If you want your new kitchen to achieve the perfect balance of ambient, task and accent lighting, Nu-Look is more than happy to help you discover your options, just contact us today so a time can be arranged.